HINGHAM — As police cars rolled into his pristine suburban neighborhood last Saturday night, past the sprawling Colonials and manicured lawns, and as dozens of officers from across the region surrounded his home, Russell Reeves begged them again and again to back off. The standoff in the quiet cul-de-sac went on for hours. By early Sunday morning, it was over, the rows of police vehicles departing all at once like a flock of birds startled into flight. Left behind, with the muddy tire ruts and broken glass, were countless questions — some of them unanswered, and some unanswerable. Reeling as the sun rose higher in the summer sky, Austin’s parents tried to understand how a simple police check on their son’s well-being had become an all-night siege. One question, they knew, would haunt them forever: If their pleas had been heard, if police had tempered their response, would Austin still be alive? 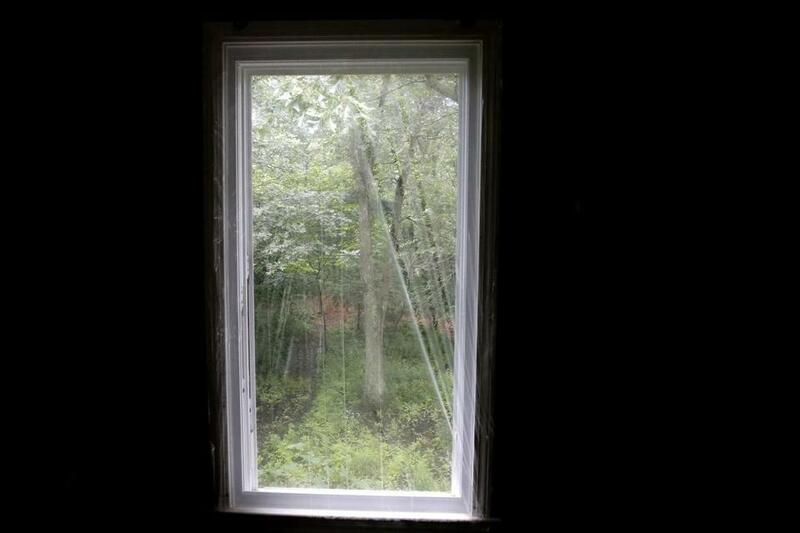 A window was shrouded in plastic after a SWAT team broke it during a 10-hour standoff with Austin Reeves. Austin Reeves gave no sign earlier that evening of any troubles weighing on him. He worked at a party, as he often did, parking cars to make some extra money. The event, in Hull, was a 75th birthday celebration held outdoors under a tent, and Austin helped to make sure it went smoothly, said the man he worked for. He greeted guests warmly as they arrived, and made sure they had drinks. He even stepped out briefly on the dance floor with one older lady guest who asked him to, after getting a nod of approval from his boss. Before he left the party, around 9 p.m., Austin kissed the hostess goodbye and wished her a happy birthday, Mongeau said. He had made plans to go out for drinks with a friend working the event with him, and he headed home to change his clothes. But sometime before he got there, Austin spoke by phone with his former girlfriend. He became alarmingly upset, according to his parents, and mentioned a gun. Concerned about his state of mind, the woman called police at 9:19 p.m., asking them to check on his welfare. 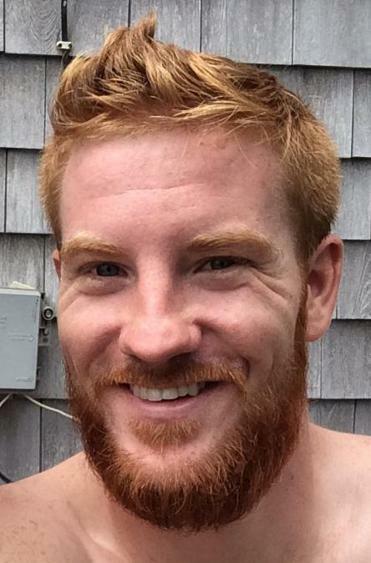 Minutes later, a Hingham police officer called Russell Reeves at home to ask if Austin had a gun with him. Reeves checked his own guns and found them locked up as always. Before he had a chance to look for the handgun his son owned, Austin walked into the house. The young man became visibly upset when his father told him the police had called. “You’re not in trouble,” his father recalls saying. “Please sit down and we’ll talk about it.” Austin refused. As he headed upstairs, he angrily issued a warning. To Russell Reeves, the meaning was clear — Austin would hurt himself if he wasn’t left in peace. Stunned and afraid, Reeves dialed the Hingham police just after 10 p.m. to ask for help. Austin told her he needed to be alone. By the time she got downstairs, two police officers were outside the house. Harrison felt certain the police would help her son. The great-granddaughter of a small-town police chief in New York, she said she has always felt safe around police. As upsetting as it was to know her son was hurting, there seemed no reason not to think that things would be OK. Austin had no history of mental illness. She thought of him as her cowboy — a young man of very few words, but in his low-key way, endlessly, wickedly funny. His parents knew his former girlfriend and were fond of her. They knew he had cared about her deeply. When he’d moved out of her house and back home in June, after the breakup, he had wept inconsolably, his mother said. But he never seemed to sink into depression. He was himself, sociable and driven, out the door by 7 each morning to his job with a landscaping and gardening crew. 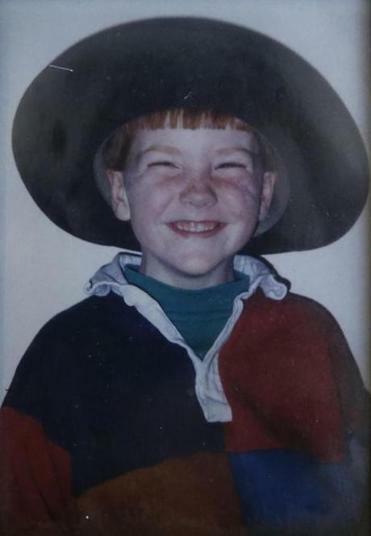 He had grown up here, in this house in Hingham, a rough-and-tumble, redheaded boy in a cowboy hat. He’d spent time away from home, too, to attend a military prep school in Virginia, and then a year of engineering school in Florida. He had played lacrosse and hockey; MVP awards were stacked in a drawer in his bedroom. He had once wanted to be a Marine, until his mother talked him out of it. He tried a job as a day trader, but found it wasn’t for him. He had learned to fly a plane and dreamed of being a pilot. Austin Reeves as a child. A Latin phrase — carpe diem, seize the day — was tattooed in artful letters on his chest. His dog, Faith, a pit bull mix his sister had rescued as a puppy, followed him everywhere he went. Faith was upstairs with him now, his parents told police, at his side as he holed up in his bedroom. His mother’s confidence in the police held steady as they interviewed her and her husband, and even as the officers removed them from their home to a neighbor’s nearby yard. Austin’s parents say the police contacted their son’s ex-girlfriend around 11 p.m., and she told them she had spoken with Austin again. Police told Austin’s father that his son had made a threat in that conversation, according to Reeves: that anyone who comes upstairs to get him would get hurt. That threat seemed enough to change the way police viewed the situation and its potential dangers, and it may have been the turning point in their response. After that, Reeves said, officers mentioned a SWAT team. As more officers began arriving, police told Reeves and Harrison they had to leave the street. His mother felt discomfort to her core: Austin was here, and he needed her. The parents asked to stay, but police said no; this was protocol they had to follow. They led the couple — Harrison still in her bathrobe — on a roundabout exit route through surrounding yards. At one point, Reeves says, he started to run back, but an officer physically restrained him. As they reached the corner, Harrison turned to look back at her home. Distant enough now to see the entire scene, she realized for the first time the full scale of what was happening: the street thick with police vehicles, teeming with armed officers in SWAT gear. Austin’s parents said they chose to speak publicly about that night in hopes of changing how police respond to similar distress calls. Hingham Police Chief Glenn Olsson declined to comment on what happened at the Reeves home, citing an ongoing investigation to confirm the cause of death, routine in such cases, by the office of the Plymouth district attorney. It is impossible to know, without a full accounting by police, exactly what steps they took that night to try and help Austin. What is certain is that Hingham police called for backup from a regional SWAT team, and other related specialty forces, operated by the Metropolitan Law Enforcement Council, or Metro LEC, a consortium of 48 law enforcement agencies around Boston that provide mutual support. Once the regional response was under way, dozens of officers rushed to the Reeves home. The couple reported seeing vehicles from Braintree, Bridgewater, Attleboro, and Randolph, among others. A recent photo of Austin Reeves. The regional SWAT team boasts trained negotiators and military-style equipment including a bulletproof BearCat armored truck. The SWAT team responded to 23 calls regionwide in 2016, according to Metro LEC’s annual report, including nine assists with barricaded suspects — three of whom had known mental health concerns. Like other SWAT forces, its use has been scrutinized by critics who say police have become overly reliant on heavy-handed military tactics. Canton Police Chief Ken Berkowitz, president of the regional law enforcement council, declined to comment on the events in Hingham. But he said the goal of such operations is always to get the barricaded person out alive, a complex task that relies on a team of 10 highly trained crisis negotiators to try and establish dialogue, “to help the person understand that they aren’t out of options.” A separate investigative team supports negotiations by compiling information on the subject that might help build trust and establish a rapport. A mental health clinician serves as a consultant but does not respond with the crisis team on calls. Other types of personnel do rush to the scene, including paramedics, K9 officers with dogs, and the Metro SWAT team with its heavy gear. Their rifles, helmets, vests, and armored trucks help protect the police and the public in the event that a subject with a gun starts shooting, Berkowitz said, and they also make officers less likely to use force. But if contact cannot be established, and a weapon is readily at hand, a suicidal impulse sometimes takes over, he said. It can happen before the extra forces even get there. Russell Reeves, long an outspoken critic of Hingham town government, believes it was the actions of police, their intimidating show of force, that triggered that self-destructive impulse. He wonders, with all of the police around the house, why no one heard the shot that would have told them it was over — and would have gotten paramedics upstairs to try to save his son. 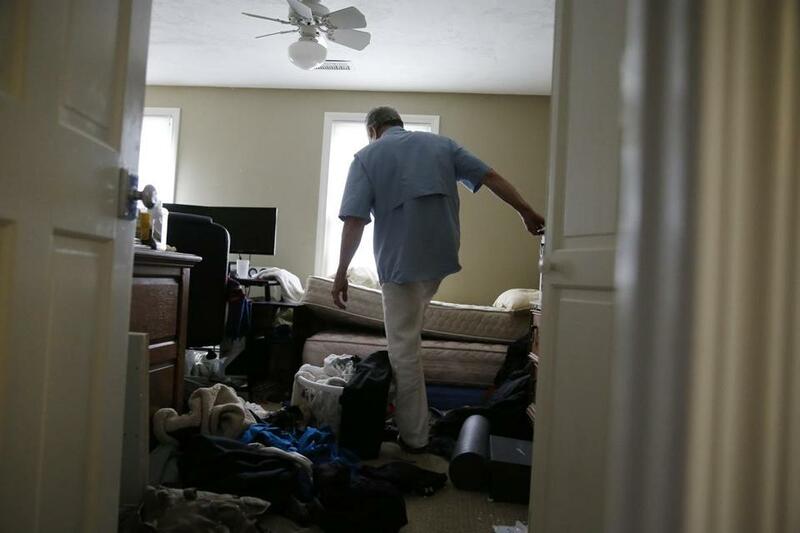 Russell Reeves walked through a second bedroom that was used by his son. At some point, his parents tried to rest, awkwardly reclining on the benches in the van. Kate Harrison was cold and too upset to sleep; she huddled under a blanket and waited for morning. Around 6:30 a.m., police drove the couple to Dunkin’ Donuts and bought Reeves a cup of coffee. At the same time, some nine hours after the episode began, a reverse 911 call from Hingham police reached neighbors’ homes, warning of a situation involving “a distressed person” and asking them to stay indoors. Police drove Austin’s parents back to the neighborhood soon after, where Harrison spotted Austin’s dog, Faith, on the sidewalk. Her heart leapt with hope: Maybe her son and his dog had fled the house. She and Reeves tried to imagine where Austin had run to, and how soon he might be in touch. Then the van door opened. The Hingham police chief stepped in. They had found Austin; he had shot himself, he told them. As Austin’s mother screamed, the chief offered to call friends or clergy. The couple asked instead to have their son’s dog, his loyal friend, with them. No, the chief said, according to the couple — we can’t bring a dog in here; it’s against protocol.